In this exercise, we will write VBA code that modifies the content and appearance of cells and worksheets. We want to modify cell A8 at the beginning of this macro. In this first example, click on "Value" and then on the Tab key to validate your choice. In this case, the property, Value, represents the contents of the cell. In this case, we're going to modify cell A8 on the worksheet, the cell from which the procedure is actually launched (using a formula button). 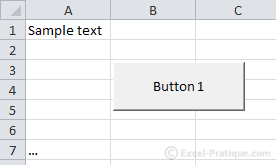 If you create a second button like this on worksheet 2, it will modify cell A8 on that sheet (sheet 2). To make it modify cell A8 on sheet 2 when you click the button on sheet 1, you have to add the following before Range: Sheets("Name_of_the_sheet") or Sheets(Number_of_the_sheet). Just the same, if we wanted to modify cell A8 on sheet 2 of another open workbook, we have to add the following before Sheets and Range: Workbooks("Name_of_the_file"). Although we used Value in these examples, you don't really need to use it, because if nothing else is specified, it will be the value of the cell that is modified. Bold = True means Characters will appear in bold = Yes. 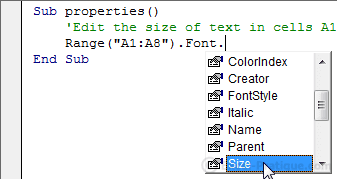 Don't forget that we've only introduced a tiny minority of the possible customizations that can be done with VBA. If the property that you are looking for isn't described in detail here, don't be afraid to look for it in the list of properties in Excel or in Excel's own help files. The macro recorder can also save you a lot of time if you don't know the name of a property. 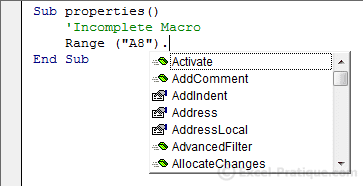 If you record the action that you need, it will be easy to find the name of the property so that you can then use it in your own macro. Anything on the left side of the = takes on the value of what is on the right side of the =. Now we're going to create a click counter. In this case, we can use With to avoid having to repeat ActiveCell. This way we don't have to repeat ActiveCell.